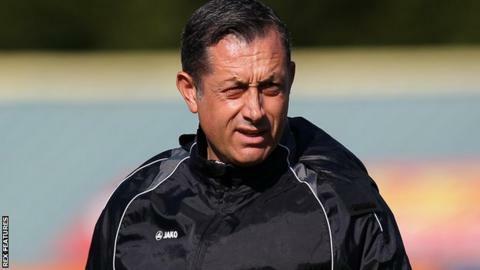 National League side Bromley have appointed Neil Smith as their new manager on a two-year deal. The 44-year-old has been in interim charge since the Ravens parted company with Mark Goldberg on 4 February. Former Gillingham midfielder Smith has won six and drawn three of his 13 games in charge at Hayes Lane. "The board have unanimously concluded that Neil and his team have the capability to match the ambitions of the club," chairman Jerry Dolke said. Bromley were 14th in the table when Goldberg departed, with Dolke citing "new investors who have higher expectations" as the main reason for his dismissal. The Ravens have risen to 11th since Smith, who was Goldberg's assistant, took over.